Hi Rimba friends, the Kenyir Wildlife Corridor Project finally has a new update to share with you! What have we been up to? Well for a start, we’ve found ourselves a new research station in the town of Gerik (Perak). Why do we need one there? This is because Reuben and Ahimsa are teaming up to start a new project in another wildlife corridor, near the town. Many thanks to Steven for getting the field house operational – it was quite difficult because the entire town of Gerik had no water supply for a week due to a landslide that took out a water treatment plant! But things are almost back to normal and the field station is 95% operational. Sheema has been helping the team catalogue more than 130,000 camera-trap photos from Kenyir into a software known as Camera Base. Although the cataloguing is far from over, we can tell you at least 32 mammal species have been camera-trapped so far – this is similar to the number of mammals recorded from camera-trap surveys in Malaysia’s largest protected area, Taman Negara. And this corridor is only 1% of Taman Negara’s size! So is this the end of our work in Kenyir? Not by a long shot! We’re still hanging on to our beloved kampung house in Basung, and we intend to maintain our presence there – hopefully long-term – in order to continue working for the protection of Kenyir’s forests. 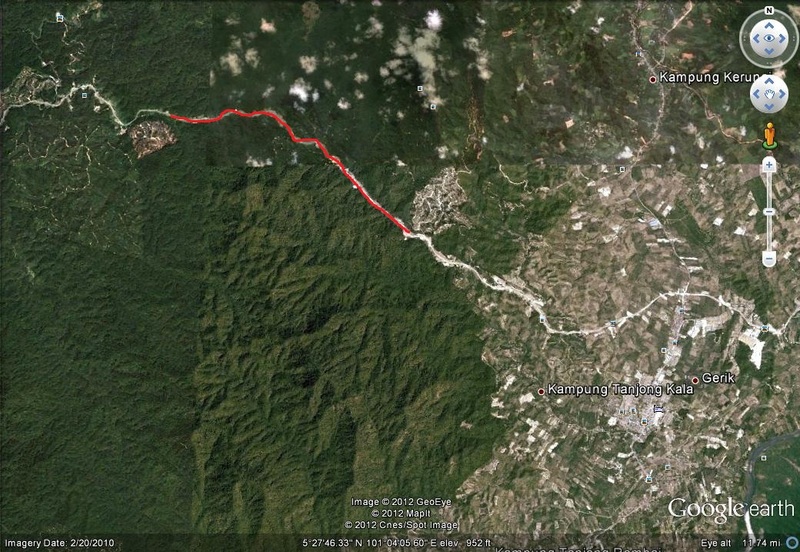 Reuben and his team are now investigating whether there is a difference in mammal species composition and relative abundance on two types of animal trails in Kenyir: those leading to the: 1) viaduct (blue line) ; and 2) directly to the highway (red line). If there are more detections of mammal species on trails leading to viaducts than those leading to the highway, then viaducts may be helping mammals cross the dreaded highway. 60 cameras (yellow) have been deployed at 60 trails for 8 months and they’ll have a better idea of animal and human activity along these trails by the end of 2012. We’ll also start posting updates and results from the Bintang Hijau Wildlife Corridor as they come in. This wildlife corridor has been identified as Primary Linkage 8 by the Central Forest Spine Master Plan for Ecological Linkages. But since this corridor lies in the Bintang Hijau Forest Reserve, we’re calling it the Bintang Hijau Wildlife Corridor Project! This study forms part of Ahimsa’s larger programme, MEME, which is currently investigating the movement of elephants in Peninsular Malaysia. The objective is similar to that of the Kenyir Wildlife Corridor Project, which is to investigate whether all 10 highway viaducts are equally utilised by elephants and other mammals in order to cross the highway. If they are not equally utilised, why? Do landscape factors (e.g. forest cover) affect their utilisation by mammals? Or do structural factors (e.g. viaduct length) have a greater influence? So now we have two available research stations open to volunteers and researchers to use. If you’re keen on finding out more or supporting our work in both wildlife corridors, drop us an email (contactus@myrimba.org) to volunteer or sponsor a camera trap! If you’d like to see more regular updates from the Rimba team, consider following our Facebook page, where we tend to post more regularly. While we do still maintain this website for the more solid research outputs and downloads that are relevant to fellow scientists, we do a lot more miscellaneous updates via Facebook, including sharing links to various other websites, articles and news items of interest. Most of our photo updates are also now done there. If you’re specifically interested in Ahimsa’s elephant work, MEME are now also on Facebook, and have set up their own independent website – so we won’t be featuring MEME Updates on this site any longer.